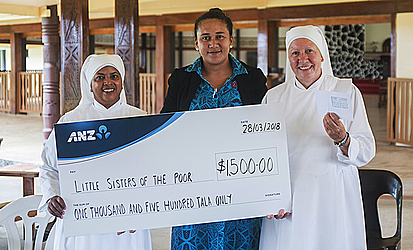 Little Sisters of the Poor received a much needed assistance from the Football Federation Samoa. Through the national Under-19 team, Football Federation Samoa donated a cheque of $1,500 and food crops worth $500 to the Little Sisters of the Poor, at Vailele on Wednesday. Football Federation Samoa, Just Play co-ordinator, La’auli Soata Utai, greeted and presented the donation on behalf of their organisation. According to the Federation’s A.C.E.O., Lynetta Fa’aiuaso, the donation was all about contributing to the community. She also said it is there response to the Little Sisters of the Poor’s request for assistance and support. Ms. Fa’aiuaso also added the donation was timely because we are approaching Easter. One of the elderlies, Telesia Tele’a, acknowledged the Football Federation Samoa and their assistance. Mrs. Tele’a thanked the Federation and wished thee Under-19 men’s side all the best in their upcoming tournament in the Cook Islands.